Juki DDL5550N Sewing Machine & Table come mounted on the table with our digital brush-less servo motor. 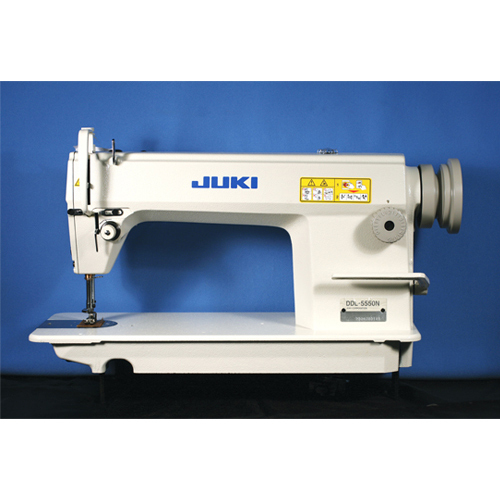 This Juki Sewing machine has low vibration and low noise, the machine head provides the operator with a comfortable work environment. In addition the distance from the machine arm to the needle on the front of the machine head is sufficiently wide to allow easy handling of the sewing material. This machine has high speed stitching performance 5,500 rpm, ease of operation, and is very reliable. Great to use on medium weight fabrics. Features include Stitch length of 5mm, presser foot lift, needles bobbin, servo motor and newest LED light included. 60 day warranty from date of purchase. The only lockstitch still made in Japan.